Mackaya Bella … the secret’s out! A little haven, hidden amongst lush indigenous gardens (with a green conscience)… just down the road from our favourite city. Professional but personal; with a twist of humour. Whether you’re here to crunch some numbers, burn the midnight candle studying or just chill out in the Durban vibe, you set the tone and we’ll do the rest. 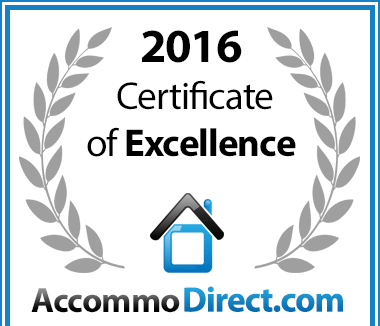 In recognition of exceptional service Mackaya Bella Guest House in Glenwood, Durban is hereby awarded a Certificate of Excellence. Welcome to Mackaya Bella, a friendly, four star graded Guest House situated in Glenwood – an upmarket, yet quirky suburb of Durban. Mike and Nicki are the new owners and we live on site, with our family and 2 well trained hospitality cats. We’ve both travelled a lot and have worked in hospitality for years, so expect a warm welcome, professional service, good food, and clean, comfy rooms. “Aaah … Oooh!” That’s what we love hearing whenever we open the door to your room. Because that means you can’t wait to come on in, put your feet up and feel like you’re almost back at home. So relax and let us and our well trained, happy team look after you. They love meeting guests almost as much as we do. We like to think we have a little oasis here, tucked away from the busy outside world. From the moment you step inside, you’ll be surrounded by our indigenous garden with a gorgeous array of different plants, animal and birdlife. It’s peaceful, pretty and definitely calming. Being Green is important to us and we are always on the lookout for new ways to save energy, recycle and reduce our carbon footprint. Started in 2008, the name Mackaya Bella is derived from the indigenous shrub which grows near the main entrance and is known for flourishing in quiet environments. Much like how we want you to feel! Whether you’re here on business, to study or on holiday, we hope to make you feel that you’ve chosen the right place to stay and are now part of our extended family. Many of our return guests tell us that this feels like their home away from home, which is the best compliment. You can see what else they say on Trip Advisor.